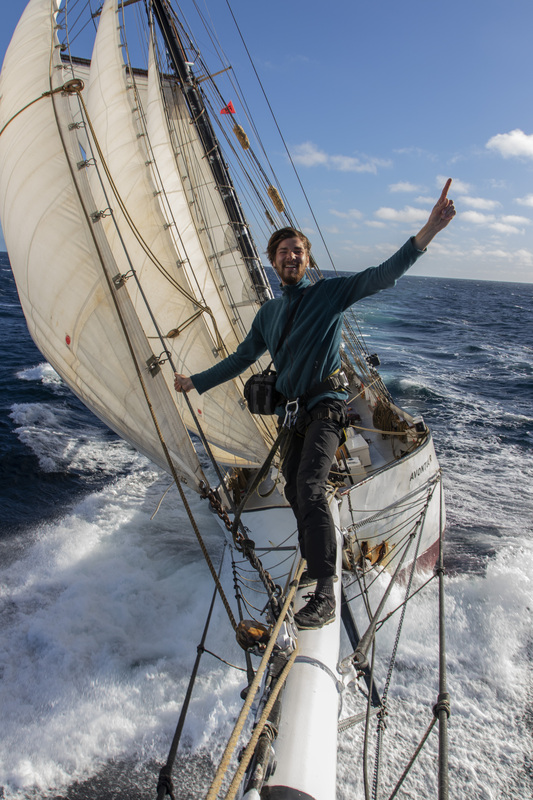 Shipmate Christoph who is also a member of the Teikei Coffee team recounts his recent time onboard the AVONTUUR. Four weeks ago, we left the little French city Blaye, close to Bordeaux, to sail into the bay of Biscaya. Against the weather forecast, we had two very calm days to enjoy the sun and the crew started wondering whether the rumors about the tough conditions in the Biscaya are true. But the third day taught es better. The seasickness spread out again while wind gale force and for some the food consisted of bananas and Zwieback, which is known to taste good in both ways, up and down. The try to prepare a bouillon turned out to be not a good idea. The sea has managed to empty the pot and spread bouillon all over the galley. It was dripping from the ceiling and could still be found in the kitchen during the next days and after many cleaning rounds. Therefore, besides “Biscaya”, also the word “bouillon” was not allowed to be said out loud any longer. We decided to sail down the Spanish coast to use the land as protection, before the wind took us out in the Atlantic heading west, finally. However, winds of gale force were also back, and the adventure continued. But whereas some suffer under such circumstances, I enjoy doing maneuvers, taking over the helm or ensuring to have fresh bread in the morning, which sometimes showed obvious marks because of the slanting position. Six breads are the maximum as I found out, after believing four were already the limit a few days earlier since gas was getting shorter. However, using baking paper twice is not recommendable. Only tasty fresh bread could satisfy the captain after a smoky galley. 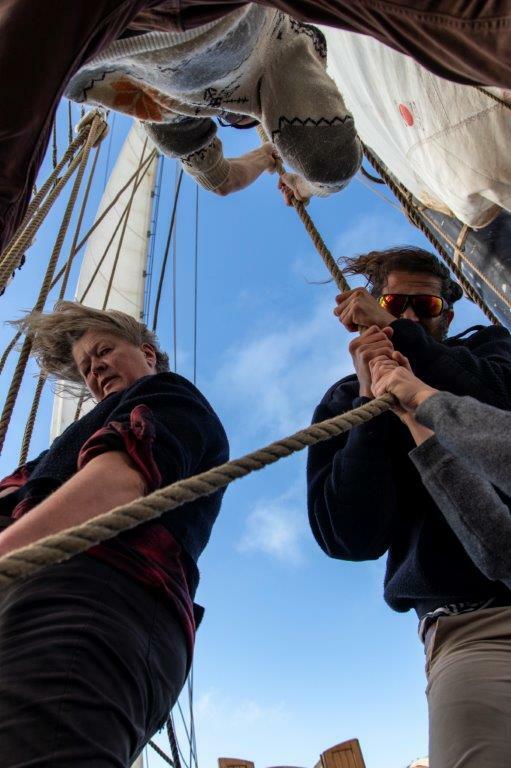 I really enjoy the time with the crew and on board of the Avontuur. It’s great to see how the Timbercoast and Teikei Coffee mutually enable such projects. 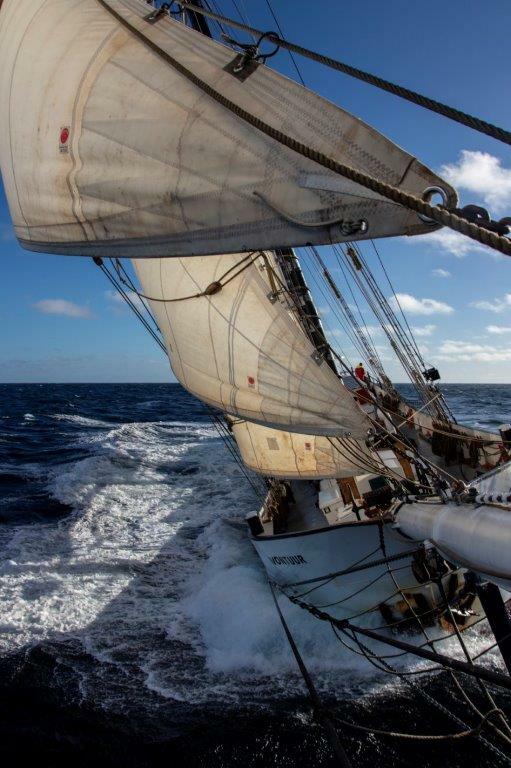 You can support our crew, the ship, and our Mission Zero by purchasing our Premium direct trade and sailed AVONTUUR products HERE.